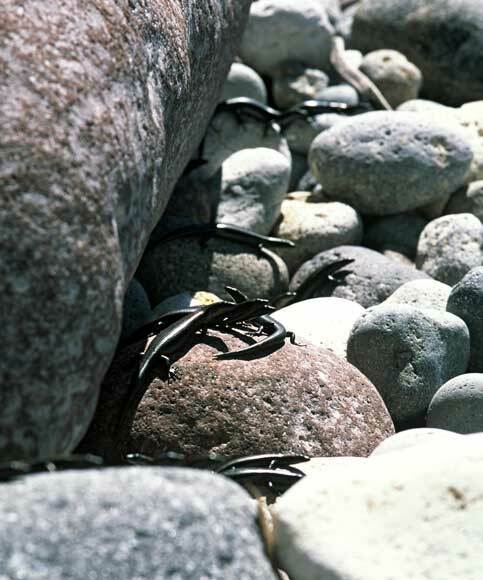 These shore skinks (Oligosoma smithi) are basking in the sun on the Alderman Islands, off the Coromandel Peninsula, in 2003. As their name suggests, shore skinks tend to live along the coast, and inland to several hundred metres. They are the most widely distributed species of Oligosoma in the northern North Island. Many populations are known to exist elsewhere on the mainland, and on nearshore islands. They range from the Three Kings Islands southwards to near Auckland on the west coast and Gisborne on the east.